Some people pop in earbuds and listen to a favored podcast on their walk to work. Others scroll endlessly through social media apps, never once looking up or taking notice of the bustling crowds all around them. But Peter Wolfe does neither on his 20-minute trek from North Station to his job on Congress Street near the Greenway. 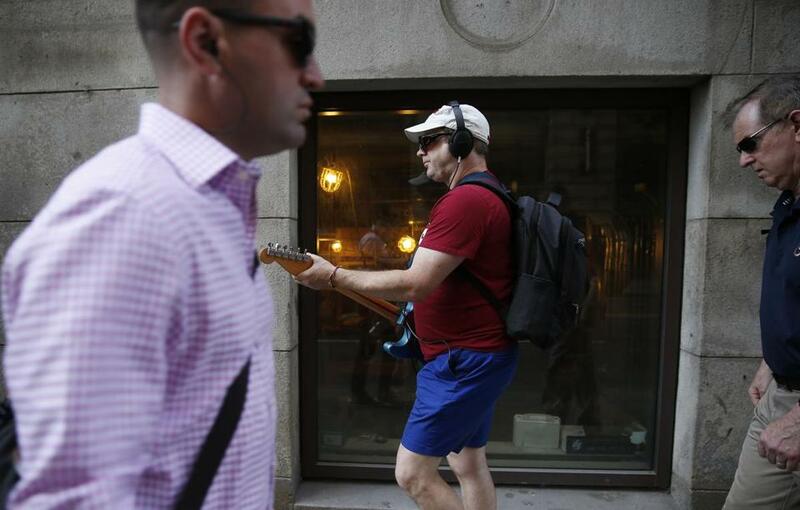 Instead, on some mornings — and when the weather permits — the Reading resident plugs a set of headphones and his smartphone into a portable amplifier connected to his electric guitar and then shreds tasty licks to his favorite tunes as he strolls to the office. Wolfe (no, not the Peter Wolf who once was lead vocalist for the J. Geils Band) has been playing the guitar for years, often while walking from place to place. Around a decade ago, before his current routine from train to office, Wolfe was a management consultant in Boston who traveled the world on business trips. He says he would bring a travel guitar along with him and play while ambling the streets of New York City and London, or the far reaches of Seoul. Even before that, when he was a student at MIT in the mid-’80s and early ’90s, Wolfe would often strum his guitar as he walked from his apartment in Boston to his classes on the other side of the river in Cambridge. Back then, Wolfe didn’t have the technical setup he enjoys now and played on an unplugged electric guitar. He added headphones and an amp “after college, when I got some money,” he said, so only he can hear what’s being played. Fast forward to Thursday morning: As the sun beat down on the hordes of commuters pouring out of North Station, a mishmash of faces with determined expressions, Wolfe appeared on the sidewalk, clearly doing his own thing. Strapped with his signature turquoise-and-white Fender Stratocaster and wearing sandals, shorts, and dark sunglasses, Wolfe crossed busy Causeway Street and began his route to the office nearly a mile away. Depending on the day and his mood, Wolfe listens to Eric Clapton, Cream, or blues. Today’s soundtrack: the Grateful Dead, one of his top preferences. But how hard is it, exactly, to walk to work and play at the same time? It depends, says Craig Jones, owner of Bay State Vintage Guitars. Depending on the day and his mood, Peter Wolfe plays Eric Clapton, Cream, or blues. Wolfe only looked down every so often during his walk, to reset the position of his hand along the guitar’s wooden neck. His facial expression remained Zen-like, his eyes shrouded by his sunglasses. A bit farther along, after passing City Hall and crossing a few major intersections, Wolfe merged with the Freedom Trail, as he pushed through crowds of pedestrians like a salmon swimming upstream. As he plucked away at the guitar strings, slowly getting closer to work, people stopped to stare. They did double-takes. They looked on quizzically as Wolfe floated by, squeezing between a fence and a row of orange plastic barriers near the corner of Franklin and Congress streets. Kyle Cornetta, director of operations at Wolfe’s company and the longest-tenured employee behind the cofounders, said Wolfe has been shredding the guitar to work for as long as he’s known him. Or walks to the tune of his own guitar. Finally at the office Thursday, Wolfe walked through the lobby of the building, guitar in hand, and then stepped into a small elevator up to the sixth floor. He walked into the office, unstrapped his guitar, placed it on a stand next to a window that overlooked his path to work, and got ready to start his day. In a few hours’ time, he would plug back in and make the reverse commute, tuning into his music and tuning out everything else. All he has to do is “block out the world, and not walk into traffic,” he said.